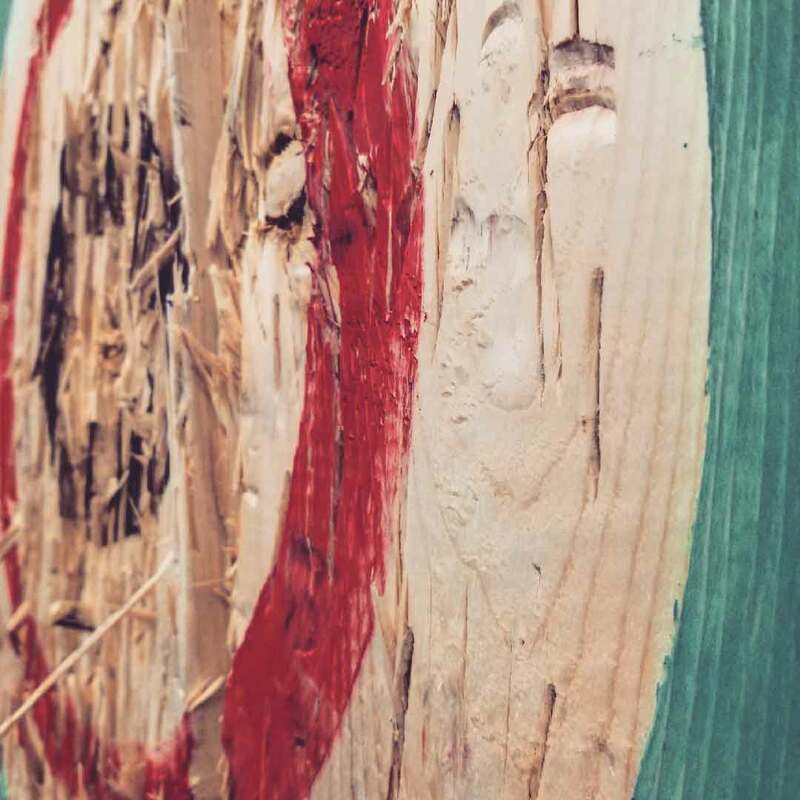 Founded in 2006, the sport of axe throwing made its start in a backyard of Toronto. Today, it’s exploded to dozens of locations and hundreds of thousands of throwers. Similar to darts, players throw a 1.5 lb hatchet at a circular bulls-eye target 15 ft away and score points based on placement. Matches are played with a head-to-head format of two players throwing at their own targets playing 3 rounds of 5 throws each. Our Total Tournament Bookings play out with a round-robin seeded double elimination tournament. You’ll know who the best thrower is, and the winner gets those sweet bragging rights. Never thrown before? No problem! Our MCs will have you sticking axes in no time. Anyone can do it, and you’ll be sure to have a great time! Even though the sport is safe, it still includes inherent risks we mitigate with our rules and staff. You will have a Monitoring Coach in the throwing lanes with you, teaching you how to throw, going over the game, and monitoring for safety. We follow tried and true rules and regulations to ensure you have a fun and safe experience. No. However, walk-in availability depends on our lane/staff availability and is first come, first served. To ensure you have lanes when you want them, we strongly recommend booking ahead of your visit. The answer is typically the earlier, the better. You can book a Tourney 2 months out while a Throw can only be booked 2 weeks out. Yes. We have a 72 hour cancellation policy. You can get a full refund if you cancel at least 72 hours before your event. Give us a call to confirm your change. How Many People Can Throw? Our basic Throw sessions can accommodate 2 to 12 players. 6 to 24 players can participate in a Tourney. Also, our private events can range anywhere from 2-70 players. Physical and electronic gift cards do not integrate with our online booking software, at this time. We kindly ask that you simply give us a call (508-251-2815) to book your throwing ahead of when you come in. We apologize for the inconvenience. We don’t allow alcohol in our space as of right now. We will also prevent intoxicated individuals from throwing to ensure safety for everyone. You are more than welcome to have a drink or two after you throw at the bar just downstairs from us, the Pit Stop Tavern. We do not serve food, but you can order from the restaurant downstairs from us, the Pit Stop Tavern. They’ll bring your food up to you while you are throwing. You are also allowed to bring your own food and non-alcoholic drinks. Bring your own plate, utensils, napkins, etc. We do not provide food or drink besides water, as we do not have cooking equipment on site. Yes! Contrary to what some may think, axe throwing is an incredibly safe sport. 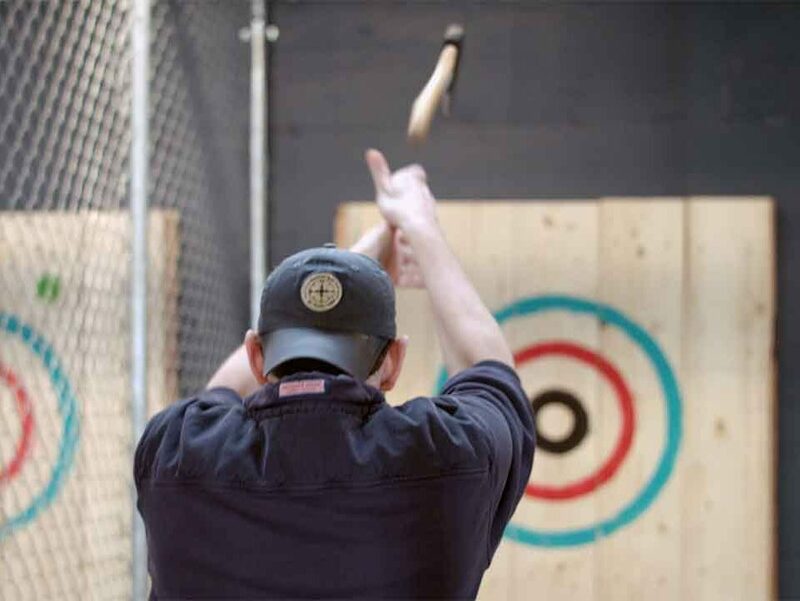 Competitive axe throwing facilities have operated for over 10 years with no major incidents. Even so, our number one priority is always safety. Coaches teach how to throw and go over safety before anything is thrown. They are with your group the entire to ensure safety. We offer two event types, Tourney and Throw. Please contact us for information and pricing for private events. We require players to wear closed-toed shoes. If we can see your toes, you can’t throw. Besides that, we recommend loose, non-restrictive clothing. You may also want to leave the heels at home. You must be at least 15 years old to both throw and/or spectate. Minors are additionally required to be accompanied by a parent or guardian. Yes! If you or someone in your group just wants to watch, they may. Spectators must still sign the waiver, though. There is a $1 fee to legalize the document. Can I Bring My Own Axe/Hatchet? No. We provide axes for you and your party. Do not bring axes, darts, knives, etc. League members may bring personal axes. Do only Pros join the league? Nope! We accept people of all skill levels to join. And with the amount of matches you get, you’ll be sure to improve. What comes with the League? The chance to compete for a prize pool of over $500 (Over $300 to the winner) and to potentially move on to the National Axe Throwing Championship in Toronto, where you could win even more prize money and compete for the Wilson Cup, the coveted axe throwing trophy. What are the axe regulations? We’re actually pretty lax on axe requirements, but you must follow the rules we do have. This is to provide a an even playing field as well as ensure safety. Other than that, you’re free to customize or decorate your axe however you choose.